SALT LAKE CITY (AP) — Utah’s Mia Love was tabbed as a rising star in the GOP when she became the first black Republican woman in Congress with her 2014 victory. But she became the latest Republican incumbent to fall in the midterm election’s Democratic wave that has seen more than three dozen Republican-held seats flipped across the country. Love had a built-in advantage with Republican voters outnumbering Democrats nearly three-to-one in the mostly suburban Salt Lake City district, but she never seemed to catch on with voters the way other Republican incumbents have in the state, said Damon Cann, a political science professor at Utah State University. McAdams, 43, touted himself as a moderate, and not a typical Democrat, in a pitch that seemed to resonate in the district where nearly four in 10 voters are independents. He also benefited from record voter turnout that was driven in part by a medical marijuana ballot proposal that spurred progressive voters to the polls, Cann said. Love, 42, tried to walk a tightrope regarding her support for President Donald Trump in a state that elected him 2016 but where the mostly-Mormon electorate has long been uncomfortable with his brash style and his comments about women and immigrants. She tried to distance herself from Trump on trade and immigration. She highlighted the times she stood up to the president, like when Trump used an expletive to describe her parents’ home country of Haiti. But she backed Trump on the GOP-supported tax reform and appealed to voters to keep the House of Representatives in Republican hands. Jill Hanauer, a Denver-based Democratic strategist, said Love couldn’t shake the association with Trump despite her efforts. Jason Perry, director of the University of Utah’s Hinckley Institute of Politics, said he doesn’t think Love did anything wrong while in office or during the campaign. He said Love simply ran up against a unique set of factors in facing a good candidate in McAdams who had previously served many of the district’s voters as mayor and who benefited from the bump of the ballot propositions that brought more Democratic-leaning voters to the polls. . The race proved yet again that the district that covers a string of Salt Lake City suburbs stretching south along the Wasatch Front to Sanpete County in central Utah is very difficult to continually win, Perry said. “It’s just not a safe seat,” he said. McAdams will have to hold tight to his “blue-dog Democrat persona” and make good on his vow to work across the aisle with Republican members of the House to hold onto the seat in 2020, Perry said. He predicted Love, was mayor of a small Utah town before winning the U.S. House seat, won’t be done with politics. Love hasn’t yet talked about her defeat, but she is scheduled to speak Monday morning at a news conference in Salt Lake City. She said she was traveling with family for Thanksgiving and issued a statement through a campaign spokeswoman saying that she had planned to call McAdams and thanking voters for participating in the process. She didn’t concede or congratulate McAdams, but she also didn’t signal that she would challenge the results. During the race, she sued a county to halt votes, but a judge threw out the lawsuit. Love finished about 20 votes short of being able to request a recount in a race where about 269,000 votes were cast. For McAdams, it’s a victory that validates his reputation as an emerging political force in Utah. He becomes the first Democratic member of Utah’s congressional district since 2014 when longtime Rep. Jim Matheson retired after seven terms. 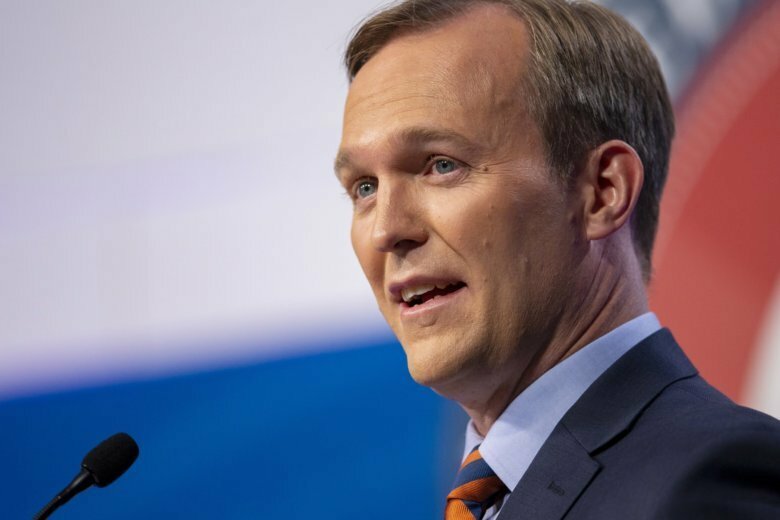 “This race was about connecting with Utah,” McAdams said. McAdams is an attorney who graduated from Columbia Law School and practiced in New York before returning to his home state of Utah. He has been a political figure in the state for a decade. He was elected as one of the few Democrats in the GOP-dominated state Legislature in 2008 and successfully ran for the Salt Lake County mayor’s seat four years later. McAdams said during the campaign he would not support California Rep. Nancy Pelosi as House Speaker and insisted he would be able to work with the president. He has already signed a letter along with 15 other Democrats vowing to oppose Pelosi.